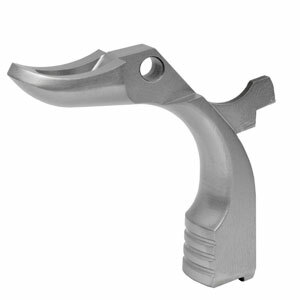 Ed Brown Beavertail Grip Safety | Ed Brown Products, Inc.
More shooters specify the Ed Brown Beavertail than all others combined. Sweeps so high on the gun it is countersunk so a Commander-styled hammer will drop into it. Our grip safety gets your hand as deep into the gun as possible. This reduces felt recoil because it better aligns the centerline of the bore with the axis of your forearm. It also improves natural pointing ability, leading to better accuracy. 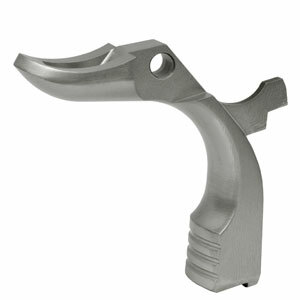 This grip safety has Memory Grooves cut into a raised pad on the rear for positive depression of the part. With normal use, your hand becomes accustomed to the feel of the grooves, and will remember where the perfect grip is for consistent shooting. The Memory Grooves also aid in depressing the safety for the shooter with thin hands. No need to pin the grip safety! 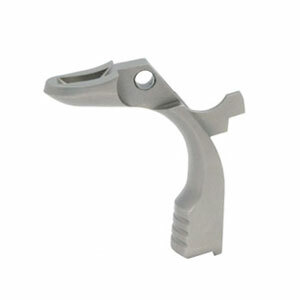 If you have ever failed to activate a grip safety, you need this part! 3D CAD designed to remove the maximum amount of metal from the frame without weakening it, you simply cannot get a better designed part. Uses a .250 radius cut on the frame centered on the thumb safety pin hole. Complete installation instructions included. See our beavertail installation jig #886 for an easy way to establish this .250 radius.